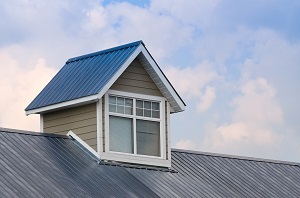 Reap the benefits of all that a metal roof has to offer with My-Pros' expert installation. My-Pros specializes in the installation, repair, and replacement of metal roofs. We offer all types of metal roofs including standing seam metal roofs, metal roof shingles, metal roof panels & sheets, and more. We also offer a variety of metal roof colors and styles to fit any home, garage, barn, or other structure. If you live in Belvidere, Rockford, Loves Park or any town or city nearby, contact us today for a free roofing cost quote. This roof is very steep, and we had to work on ladders the majority of the time. Removing several layers of old roofing shingles and wood shake was a very messy job, but My-Pros loves a good challenge! The finished result looks amazing, and the owner was very happy with the outcome! This was quite an interesting project. Ever since the homeowner was a young girl she had dreamed about living beneath a red metal roof. Our crew quickly got to work tearing off the existing shingle roof and replacing it with an all new durable metal roof in quite an eye-catching shade of red. My-Pros was happy to help make this homeowner's dream come true. She now has a durable roof that looks beautiful. This airplane hanger had a metal roof that was well past its expected lifespan and covered with patches of rust. My Pros completely tore off the old roof and installed a new one, while also adding six new skylights. The owner is very happy with his new roof and really appreciates the skylights, which serve to let more natural light inside the structure. Tom B. of Rockford, IL had My-Pros replace his old, damaged asphalt roof with a new 29 Grade Steel Classic Rib roof in the color Black. My-Pros was hired to replace the metal roofs on three different buildings on this farm. We did relocate the skylights to a better location for natural light to come inside the barn. The homeowner is building a dream home for his wife and two daughters out in the country. The guys at My-Pros really enjoyed the scenery this home is being build on. We were hired to install a new metal roof, fascia & soffit on the home. The back wall is 24' tall so to keep our employees safe we decided to rent a boom lift. Of course we have ladders that could of been used instead of the boom, but not as much fun. The customer decided to go with a light color blue metal roof and a dark brown color for the aluminium fascia & soffit. At first we were not sure how those two colors would go together. At the end of the project once everything was installed we were impressed with the color scheme the homeowner had choose. The pictures doesn't give the color scheme any justice you would have to see it in person to really appreciate it like we do. "Professional, knowledgeable, helpful with all aspects of..."
"Your quote was fair and detailed. Your explanation for..."
"We were aware it was about time to replace our roof, but..."
Founded in 1963 and now operating over 20 locations across the continental U.S., Metal Sales is the nation's largest manufacturer of metal roofing, wall and building systems. The metal roofing products available from Metal Sales Manufacturing Corporation are resilient and have several applications, including residential, commercial, and agricultural. These readily available products can make a big difference for your property's protection and aesthetic appeal. With over fifty years of experience in the industry, DECRA is a leader in manufacturing stone coated and steel roofing systems. We aim to produce superior metal roofing materials while committing to improvement and abiding the highest building standards. DECRA provides metal roofing products that are not only beautiful and elegant but endurable with longevity to last years! DECRA metal shingles come in a variety of styles and colors to help you accentuate your home and gain instant curb appeal. We have two types of tile shingles to choose from, DECRA Tile and DECRA Villa Tile. DECRA Tile resembles old world Mediterranean beauty, while Villa Tile provides a more traditional Italian appearance. No special installation tools needed. Get a free metal roof cost quote today! Our roof replacement services are available all throughout the Greater Rockford area, including Poplar Grove, Byron, Cherry Valley, Winnebago, Davis Junction, Clinton, Pecatonica and nearby!